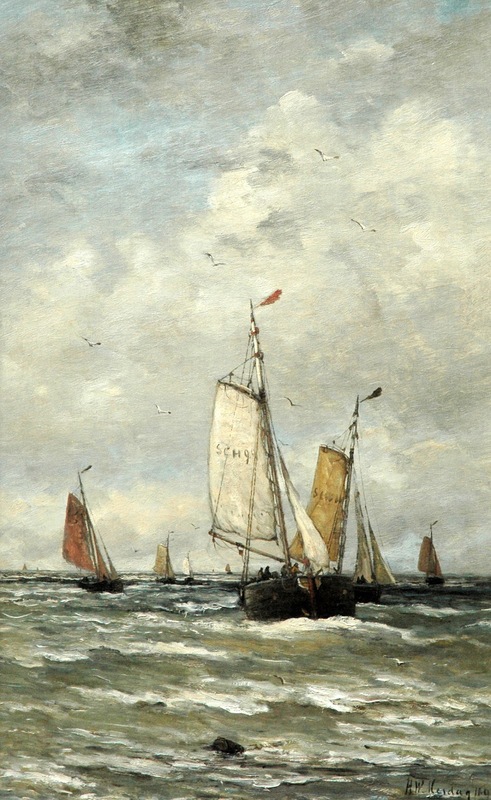 Hendrik Willem Mesdag, born in a wealthy Groningen family of bankers, worked in his father’s business till the age of thirty-five. 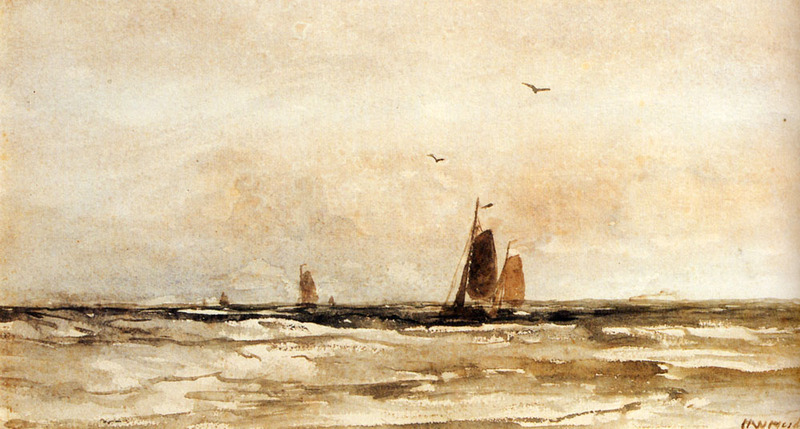 After an inheritance of his wife, Sientje van Houten, had rendered him independent, he abandoned his secure position at his father’s bank and followed his artistic ambitions. 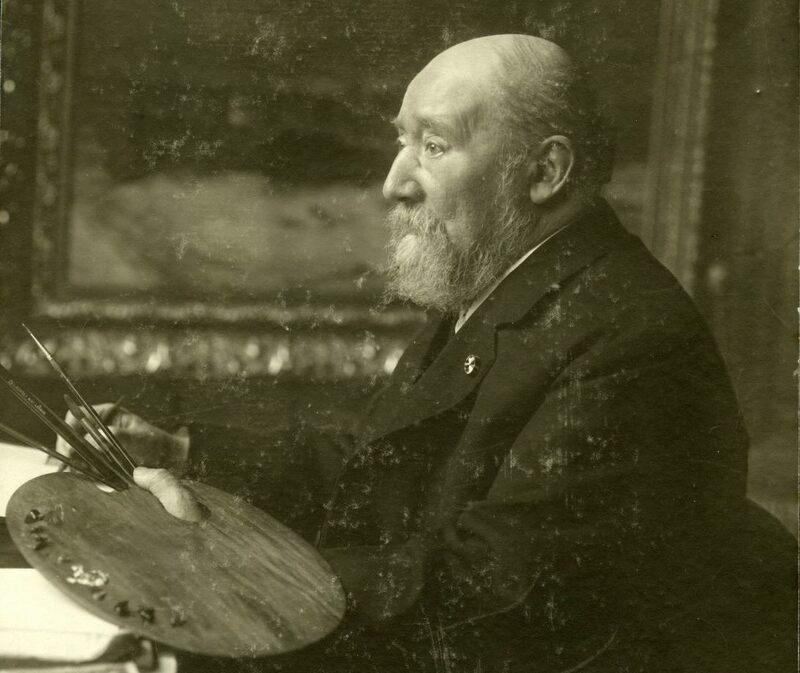 During a four years stay in Brussels he served his apprenticeship with the famous landscapist Willem Roelofs and grew familiar with the art of the Barbizon School, sharing their fascination for working in the open air (En plein air). 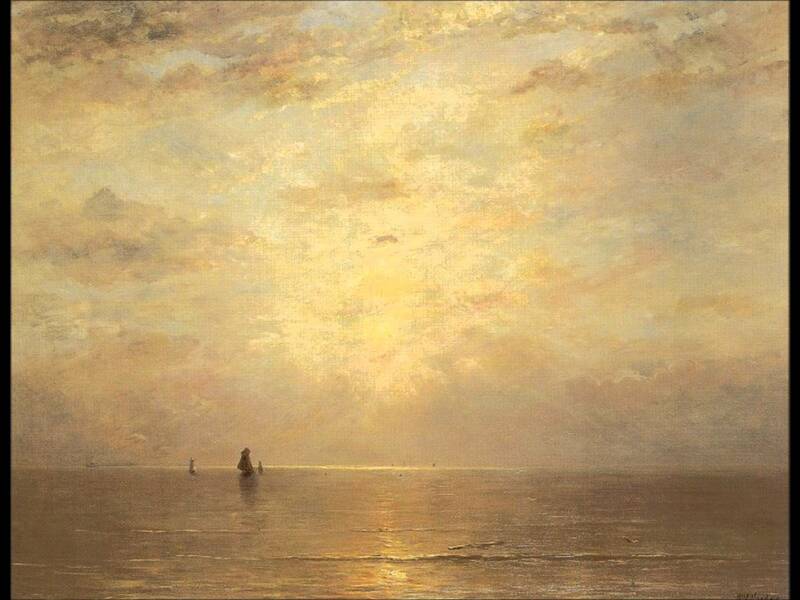 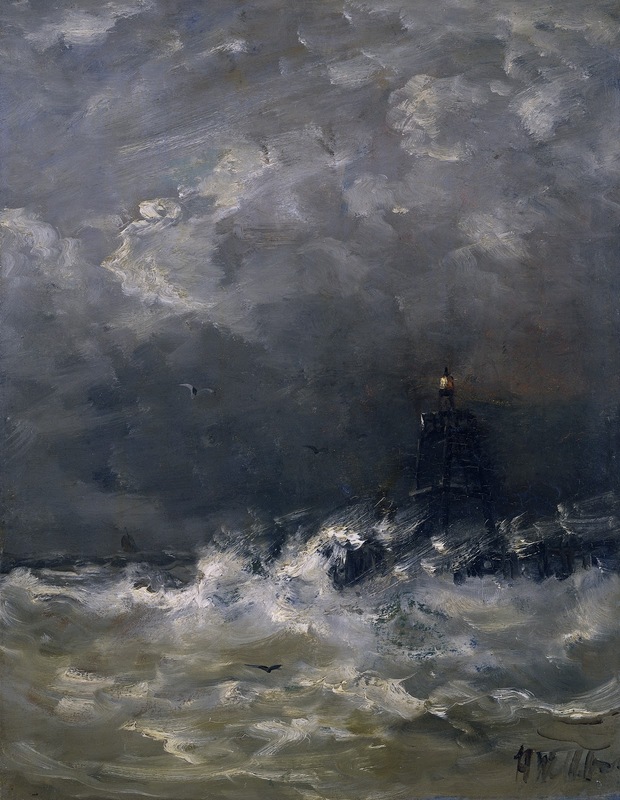 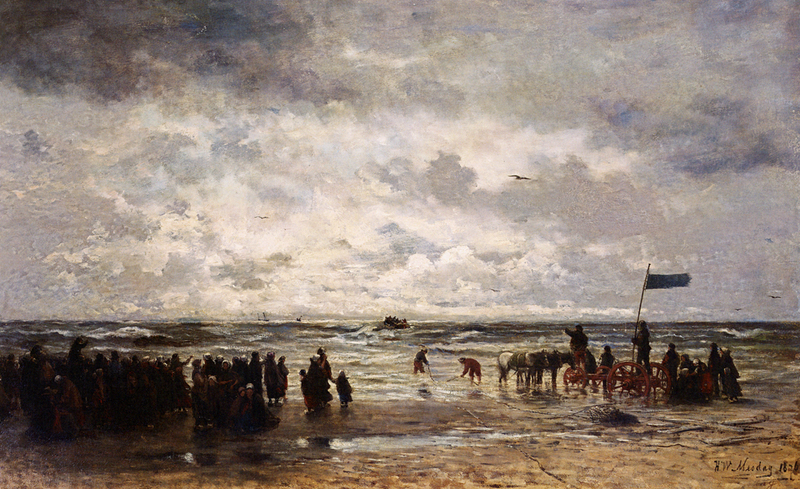 After a stay on the German island Norderney in 1868, Mesdag got fascinated by the sea. 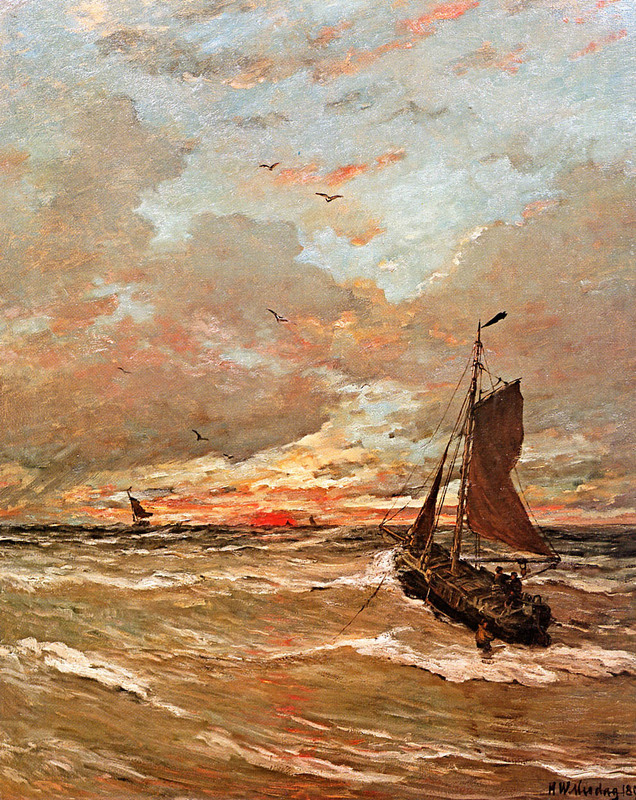 After a stay on the German island Norderney in 1868, Mesdag got fascinated by the sea. 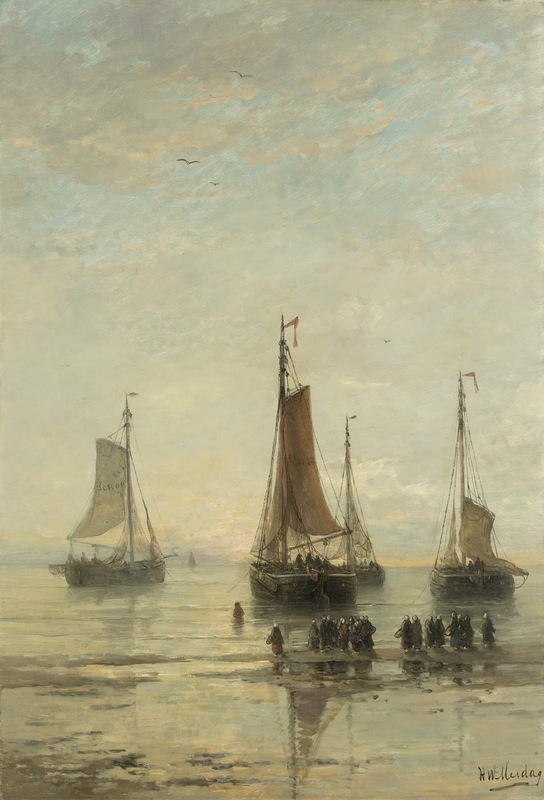 Compared to the highly finished, minutely detailed seascapes of the Romantic School, Mesdag’s brutal realism pointed in a completely new direction. 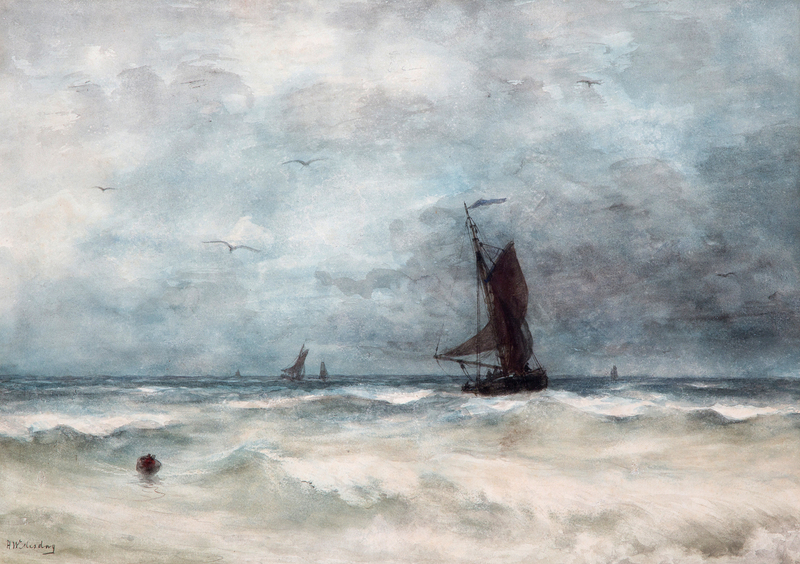 His unbiased depiction of the sea, straight from nature, was a radically new phenomenon and shocked the art world. 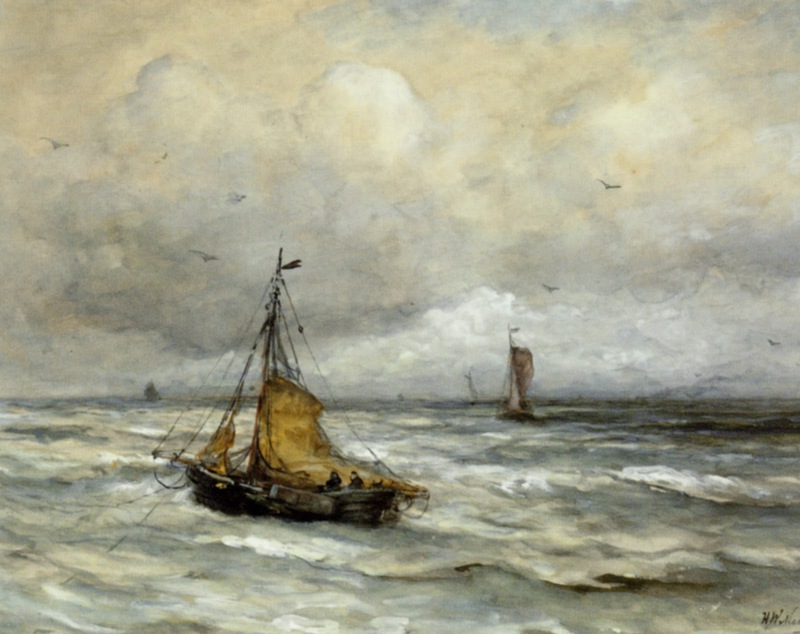 Mesdag’s vigorous brushwork and ‘real’ seas were invariably seen as proof that his paintings possessed ‘truth’ and ‘immediacy’. 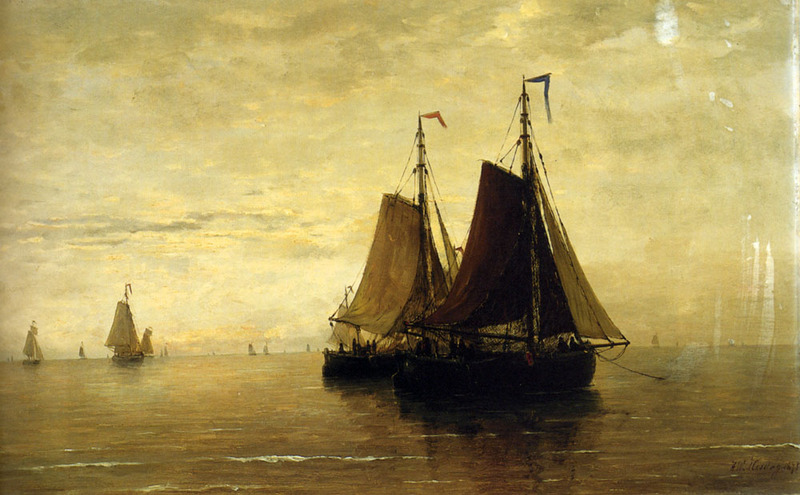 No wonder his work received wide critical acclaim. 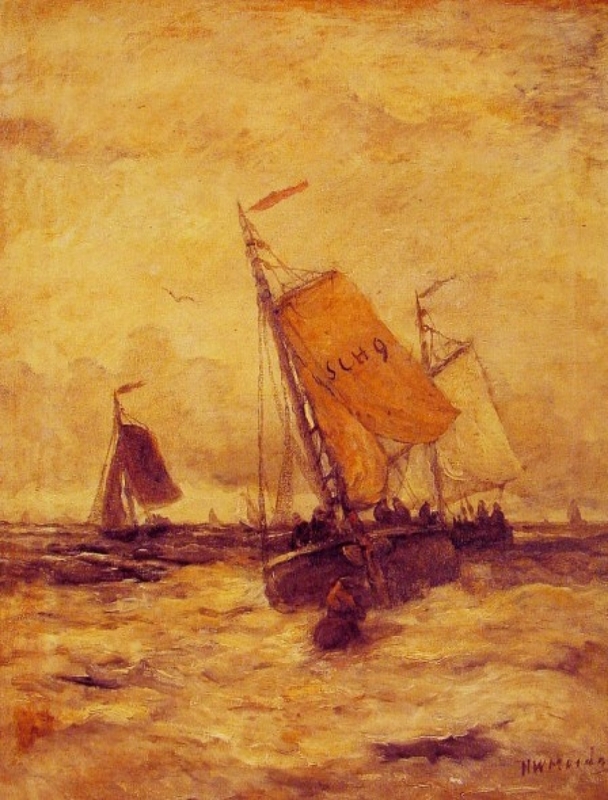 - Some of His - Best-Known Works. 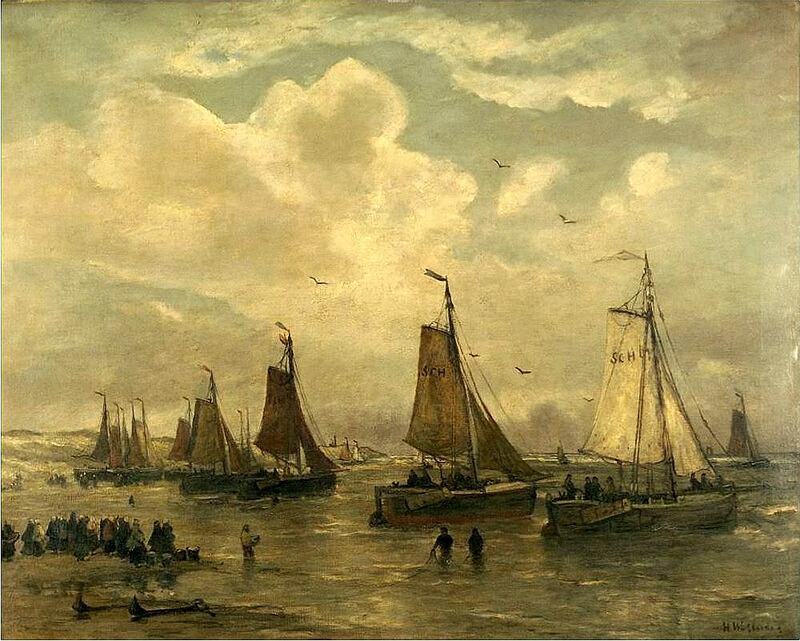 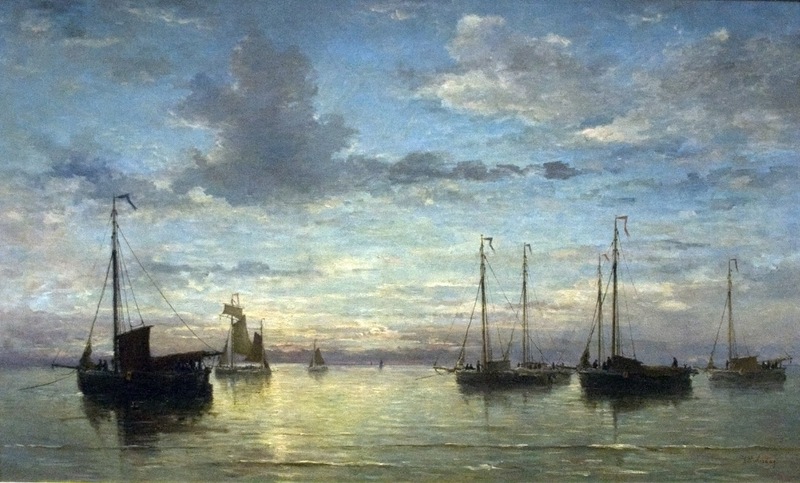 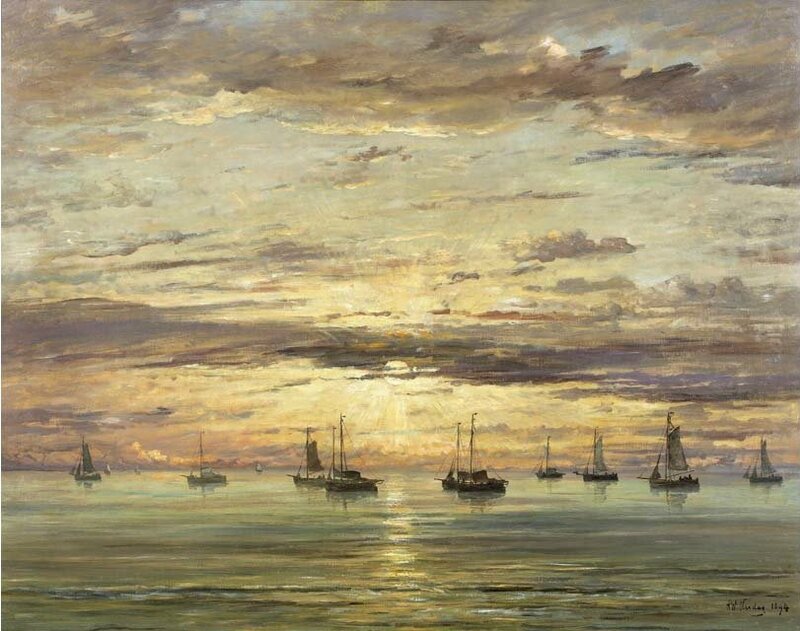 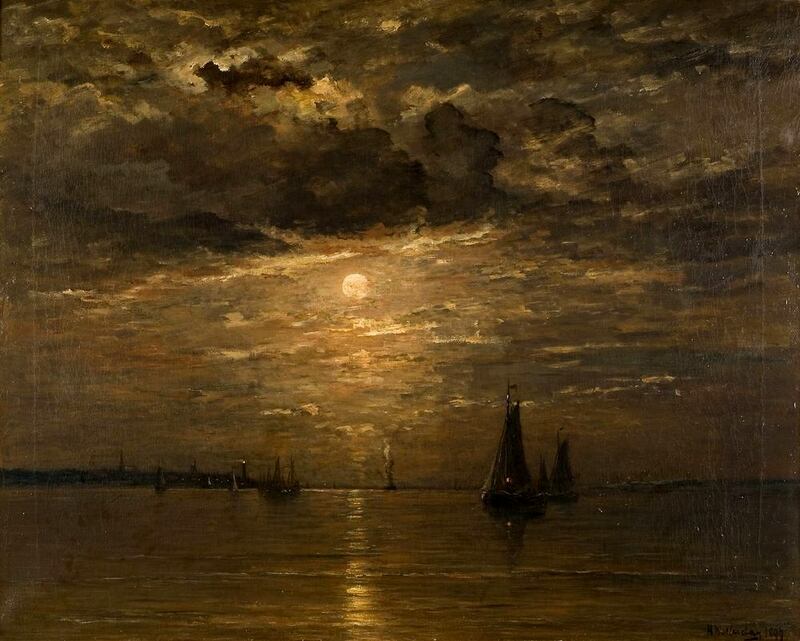 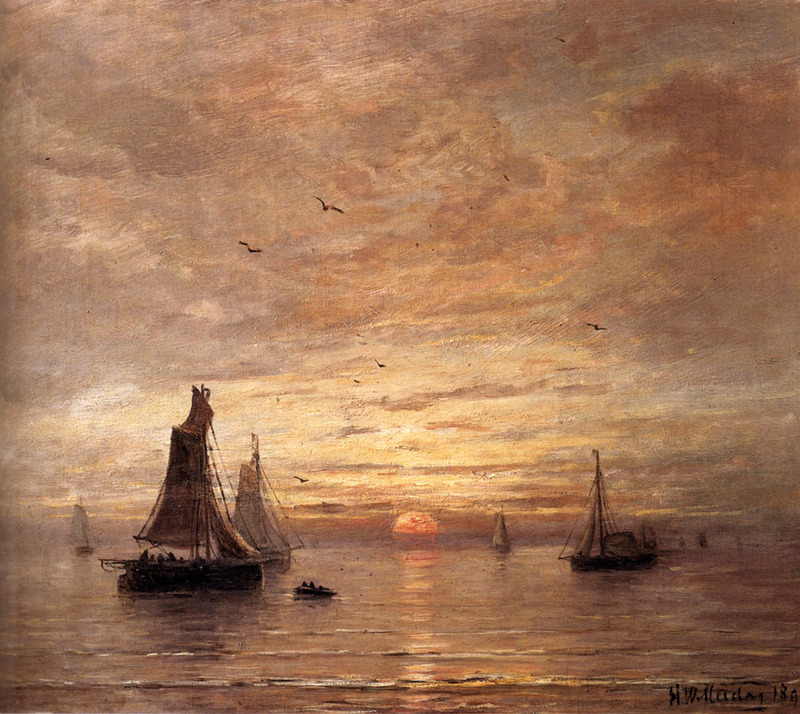 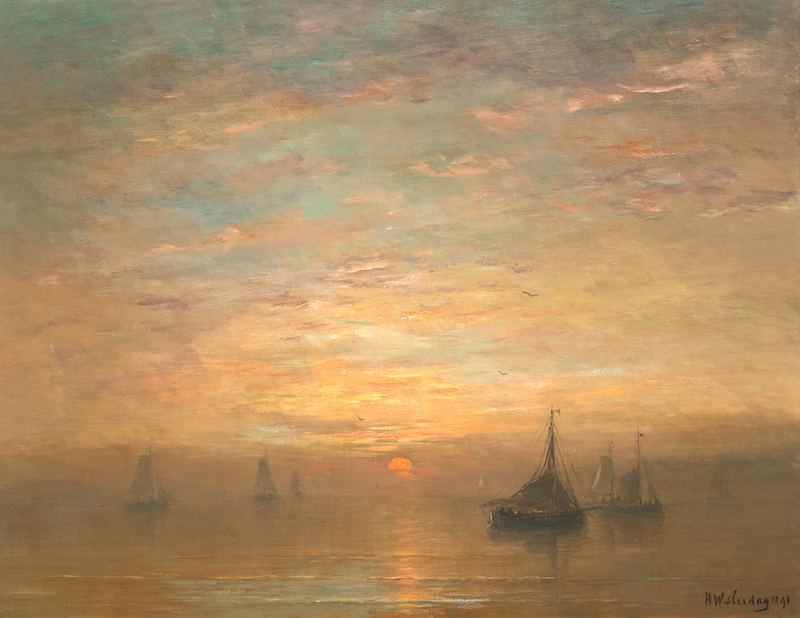 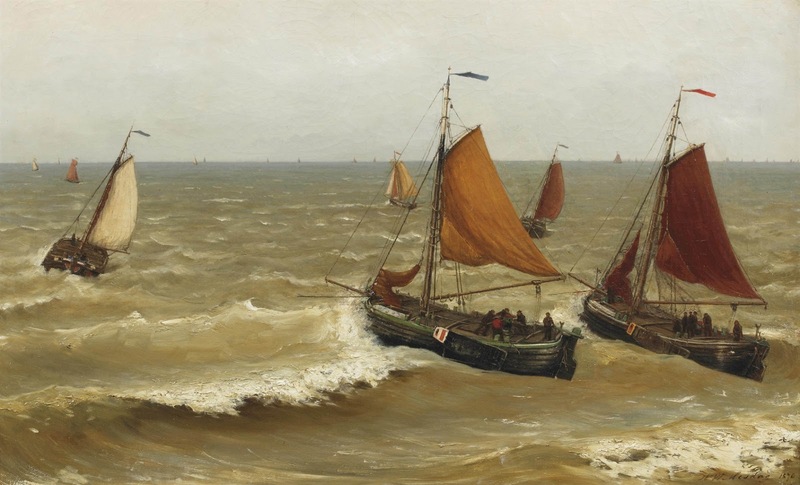 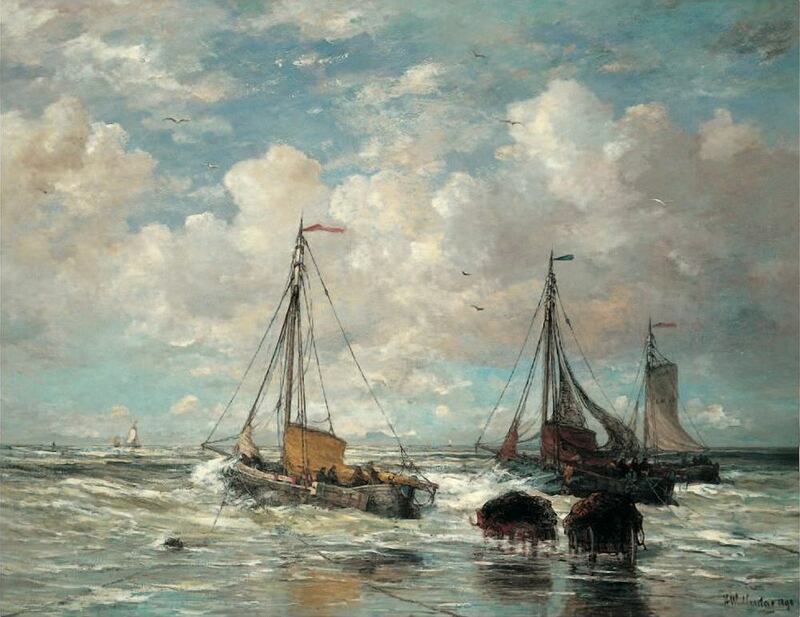 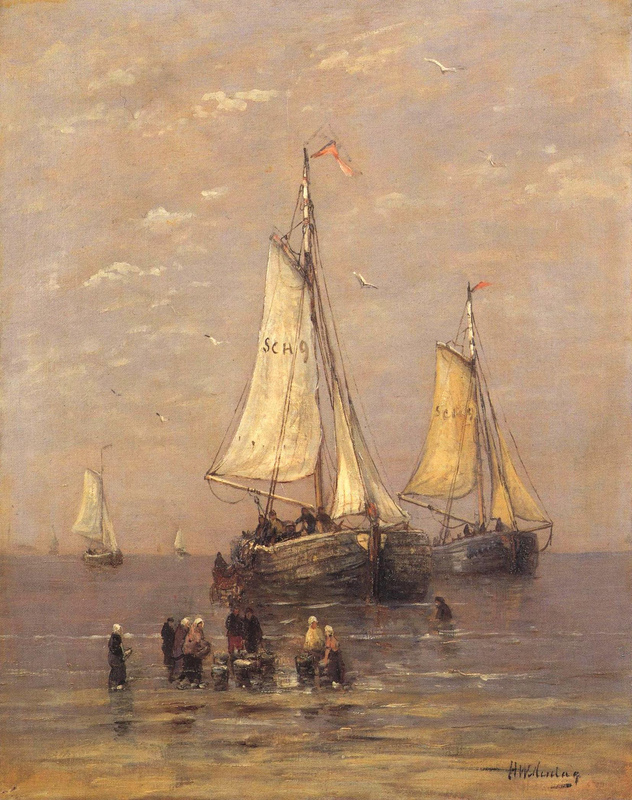 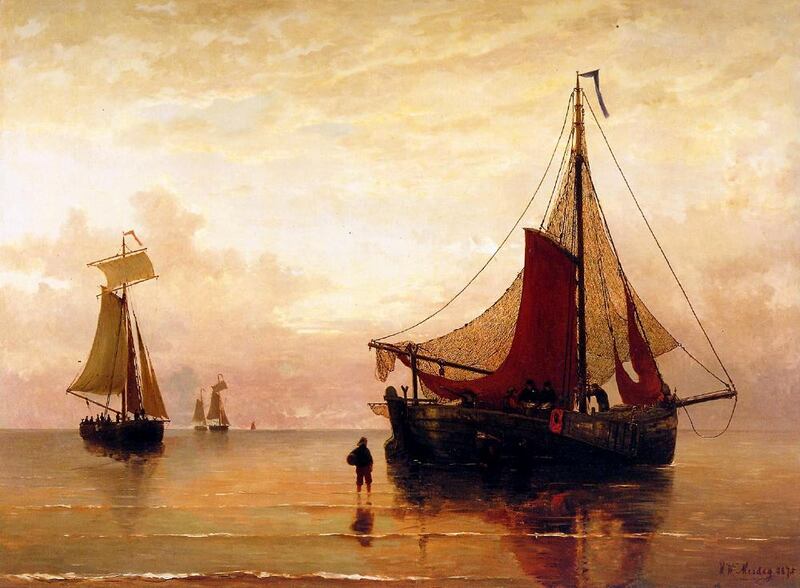 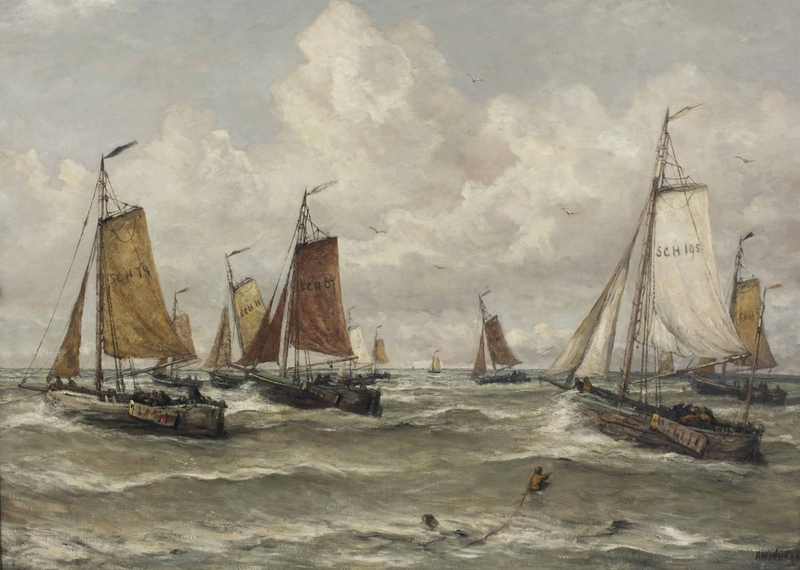 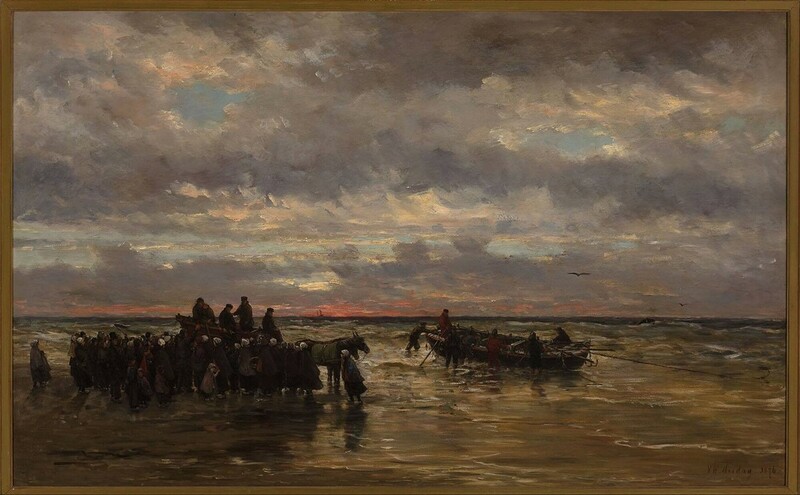 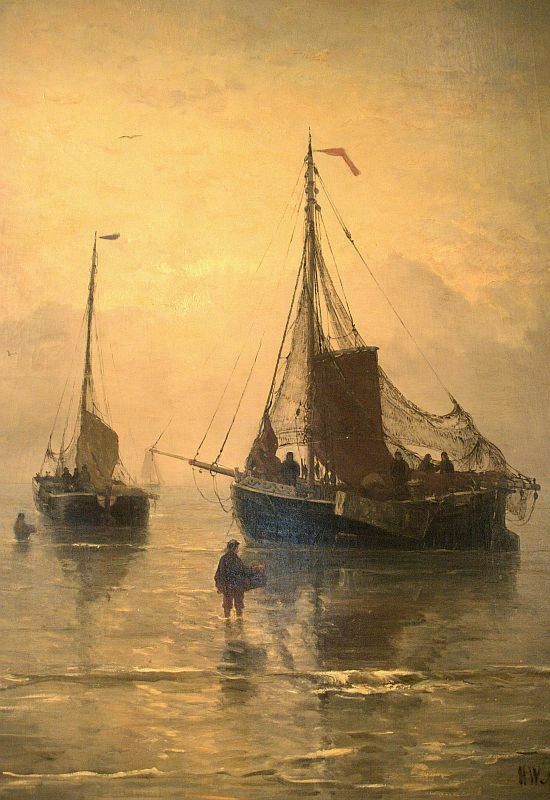 AMSTERDAM, Aug. 4 – Hendrik Willem Mesdag, the painter of sea scenes, is dead. 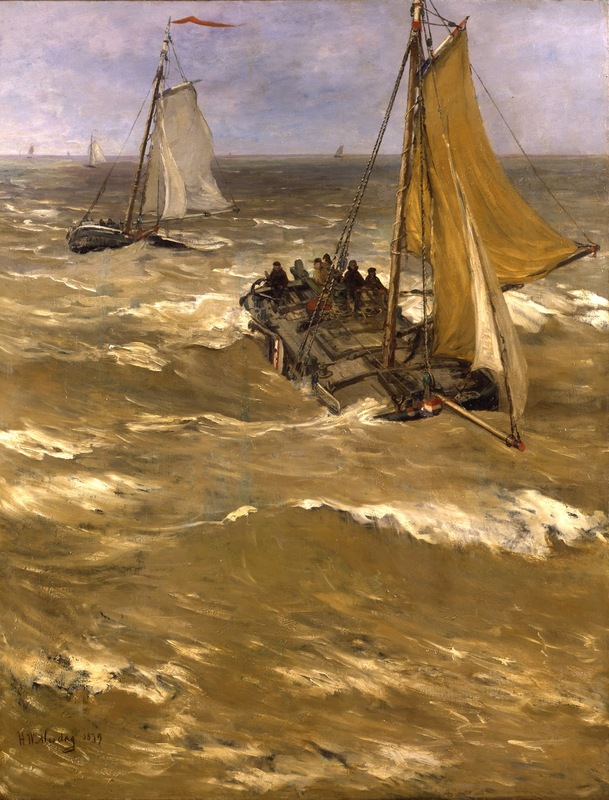 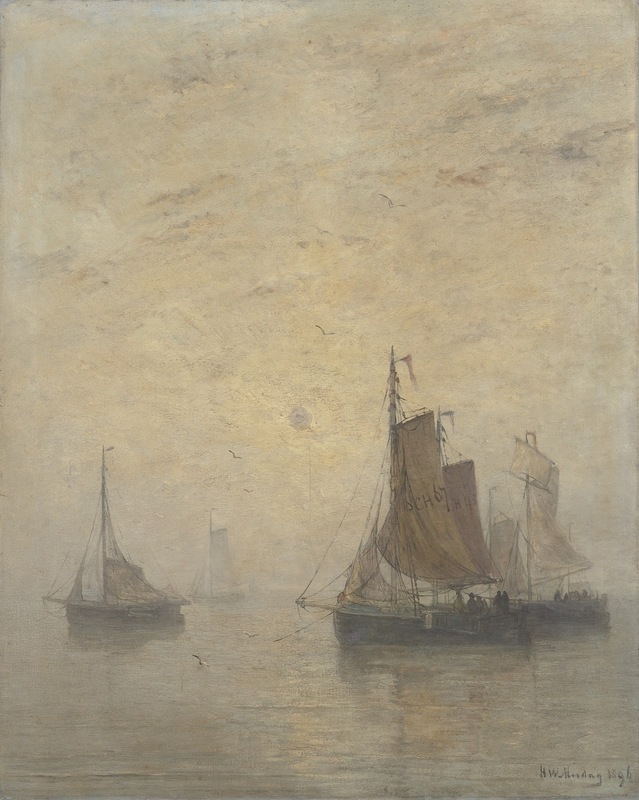 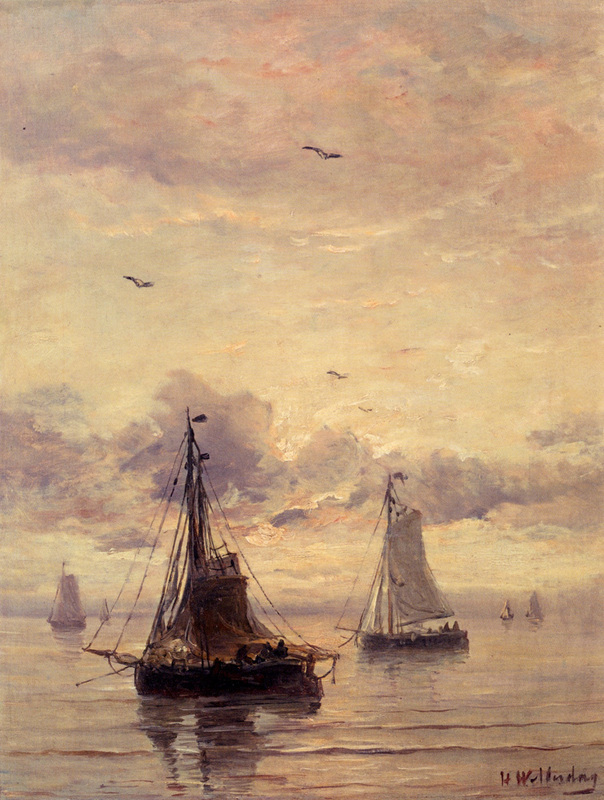 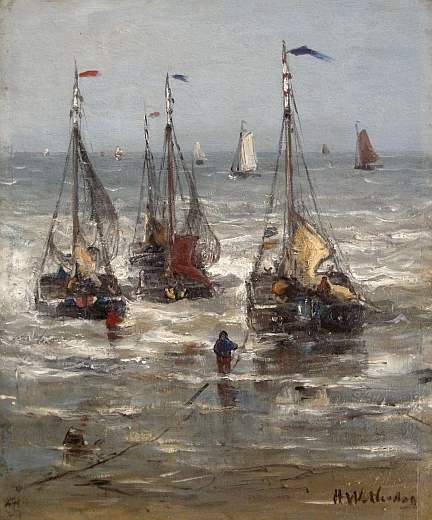 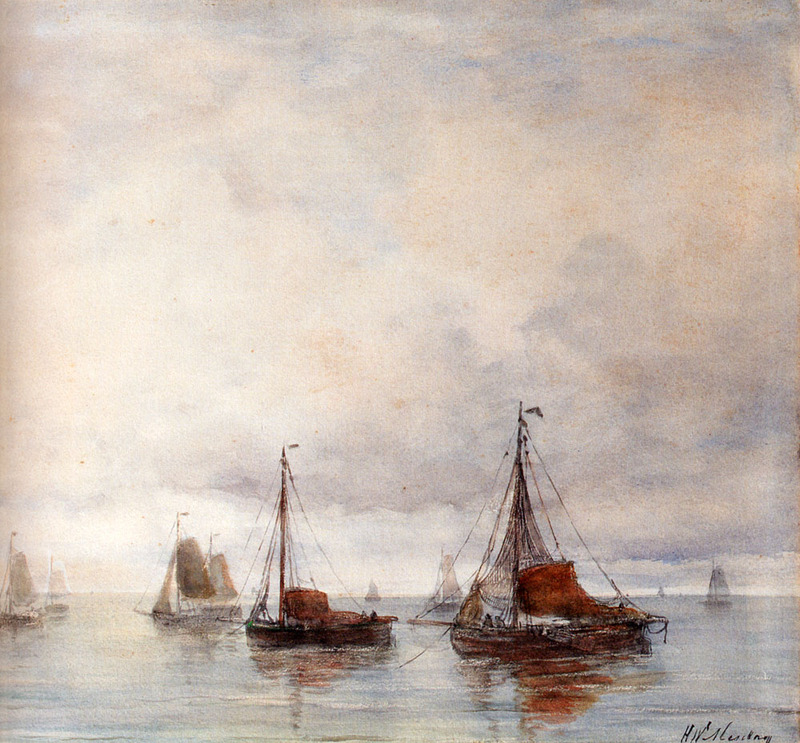 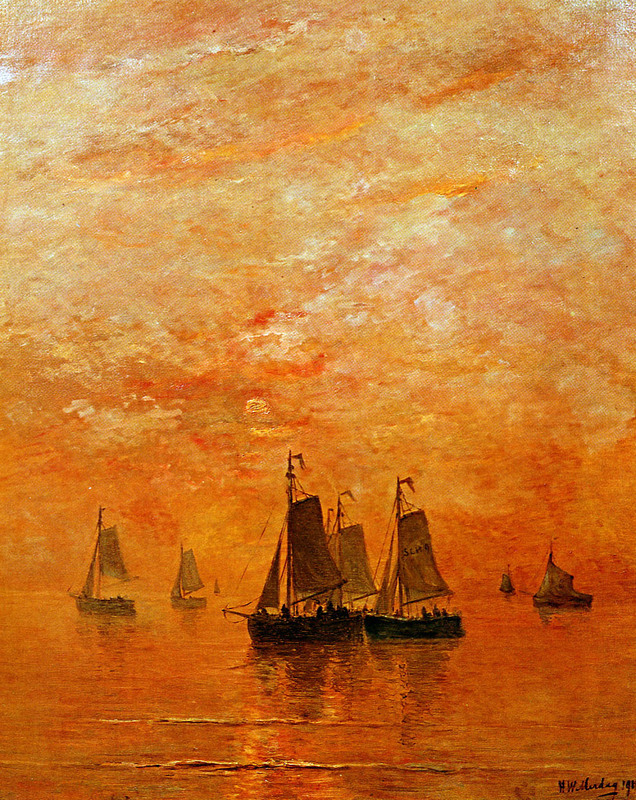 The work of Hendrik Willem Mesdag has long been recognized in Europe as among the finest, in its representation of the sea in all moods, produced in the latter part of the nineteenth century, but in this country there are at present few of Mesdag’s pictures, and it is only recently that the attention of American buyers has been’ directed to his productions. 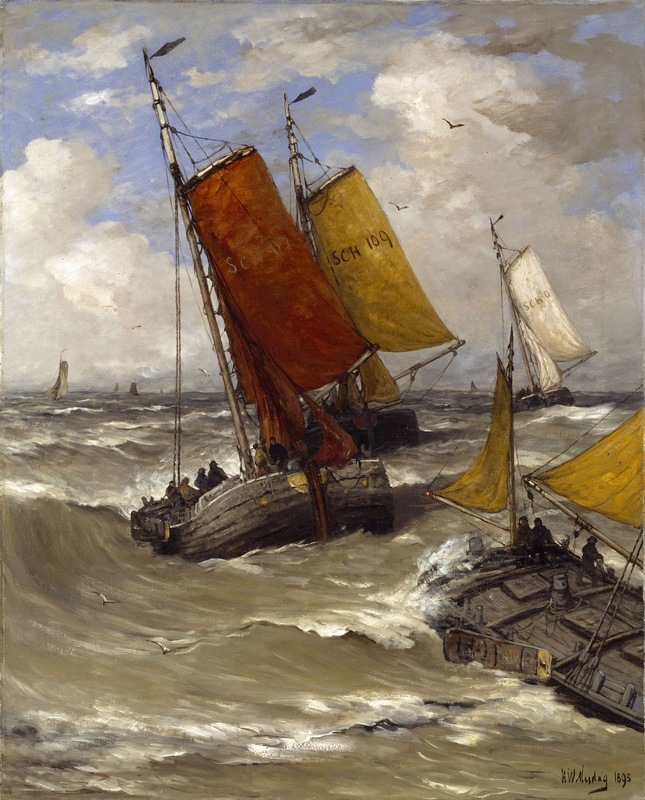 Such an authority as Richard Muther describes Mesdag as “one of the first marine painters of the world”, and says that “since Courbet few representations of the life of the sea have been rendered with such fidelity and strength of expression”. 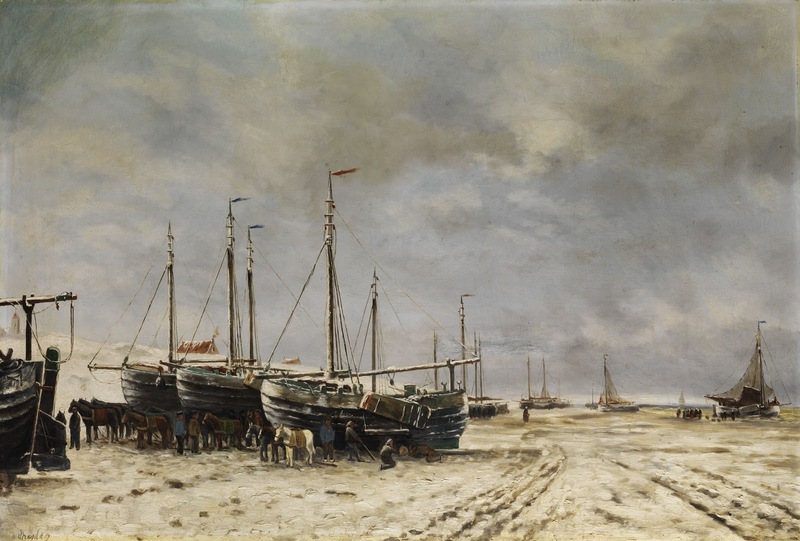 It is a characteristic of Mesdag’s pictures that they are painted as though viewed from the sea itself, and not from the land. 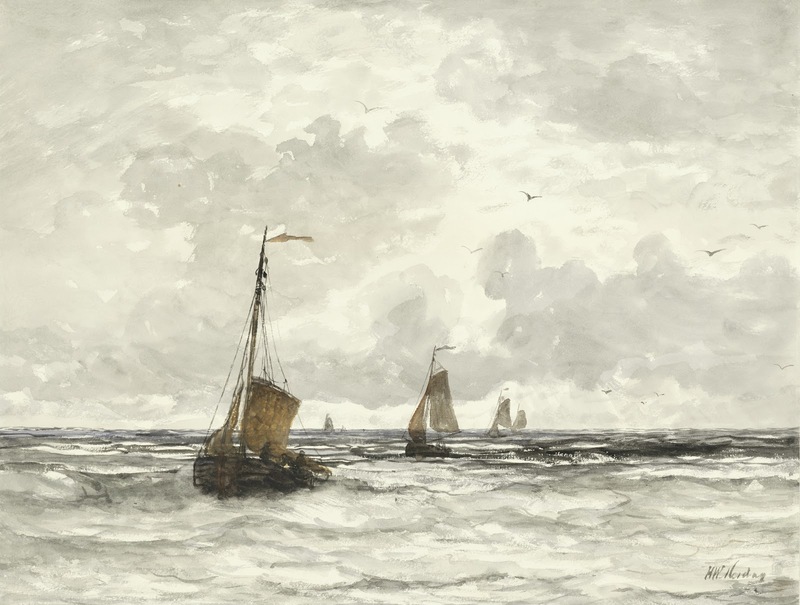 Unlike most other sea artists, too, the Dutch master preferred the sea when it is troubled-when a’ storm is threatened and the sky is overcast. 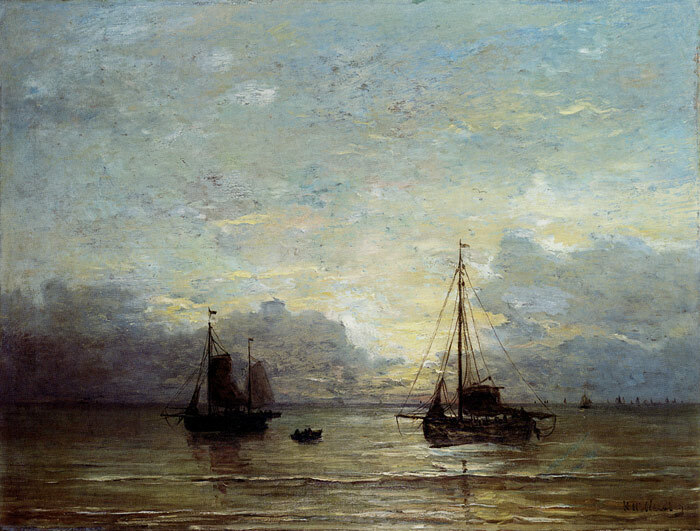 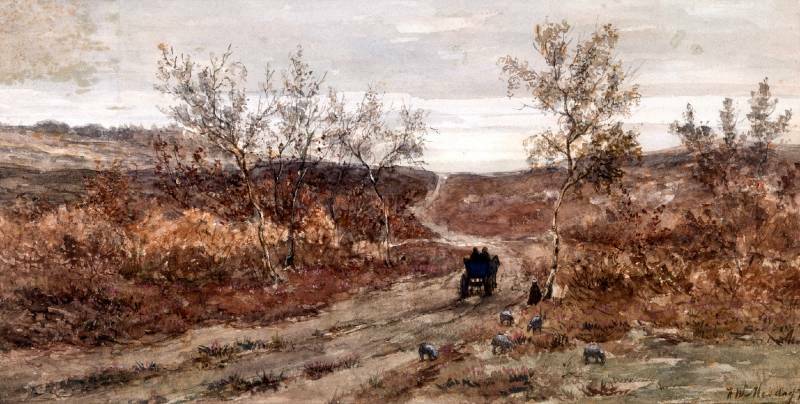 Mesdag was born at Gröningen in 1831. He, only decided to become an artist comparatively late in life, but after he had exhibited his first important pictures his success came rapidly. 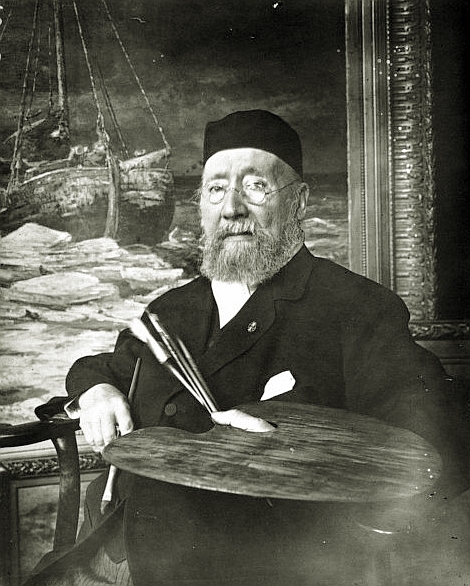 He gained a medal at Paris in 1870, and another in 1878. 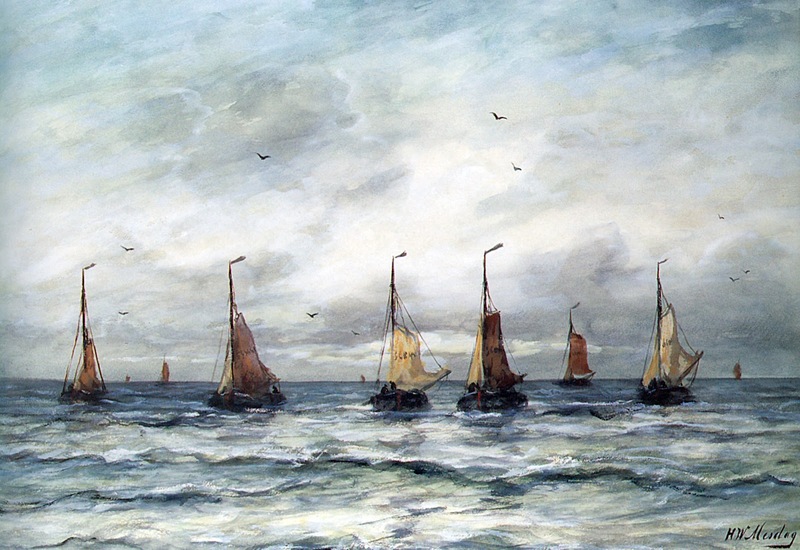 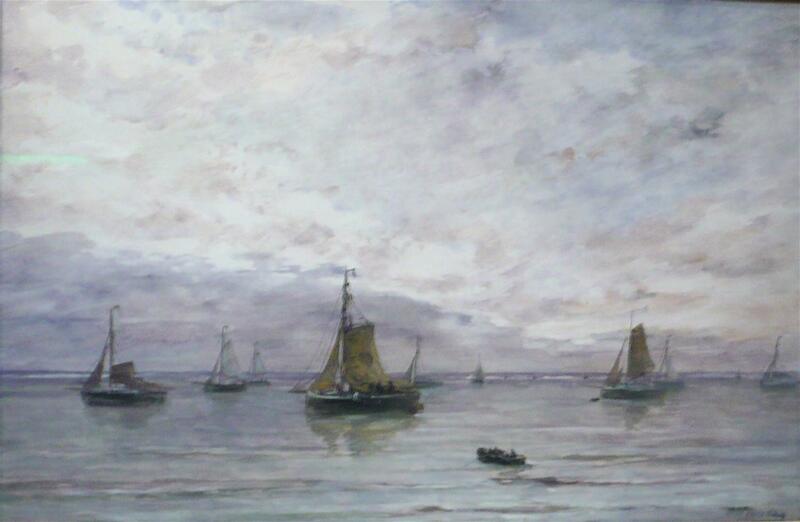 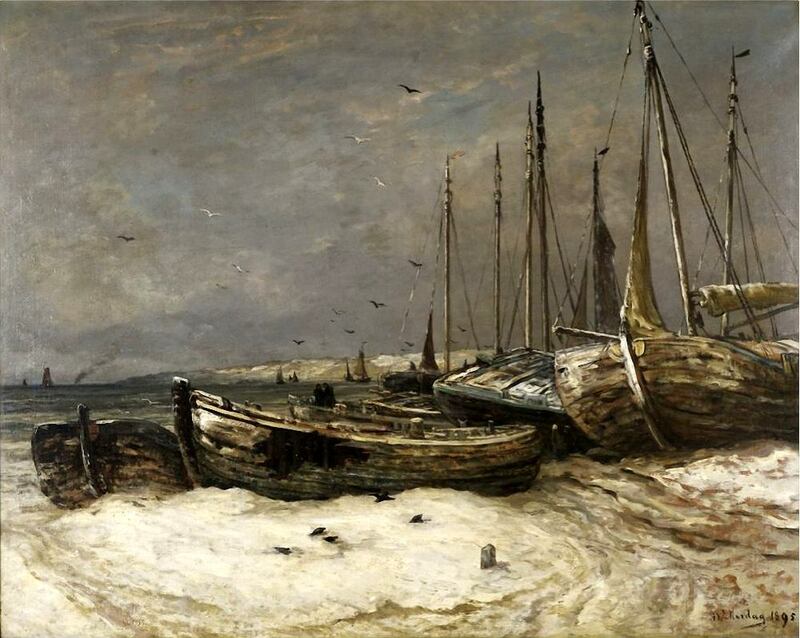 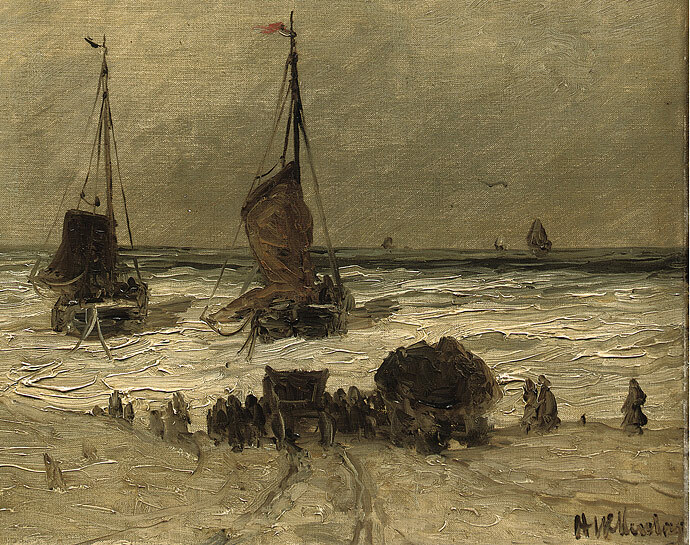 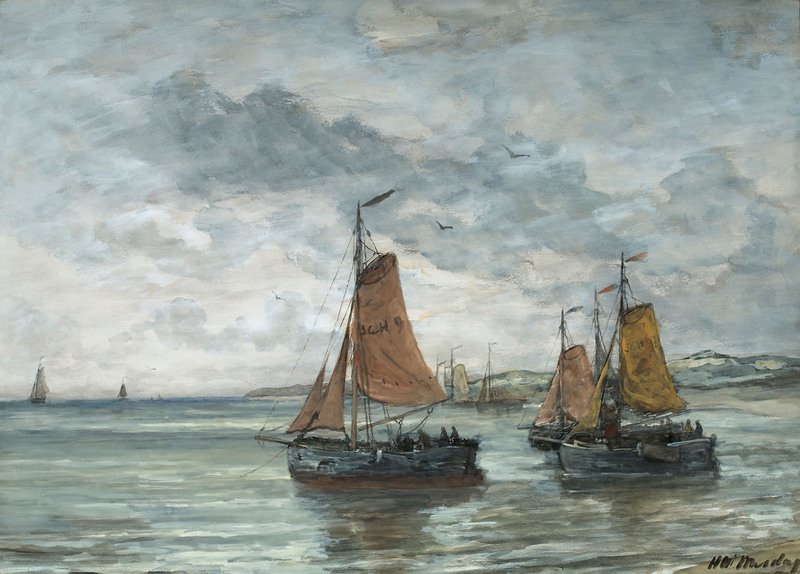 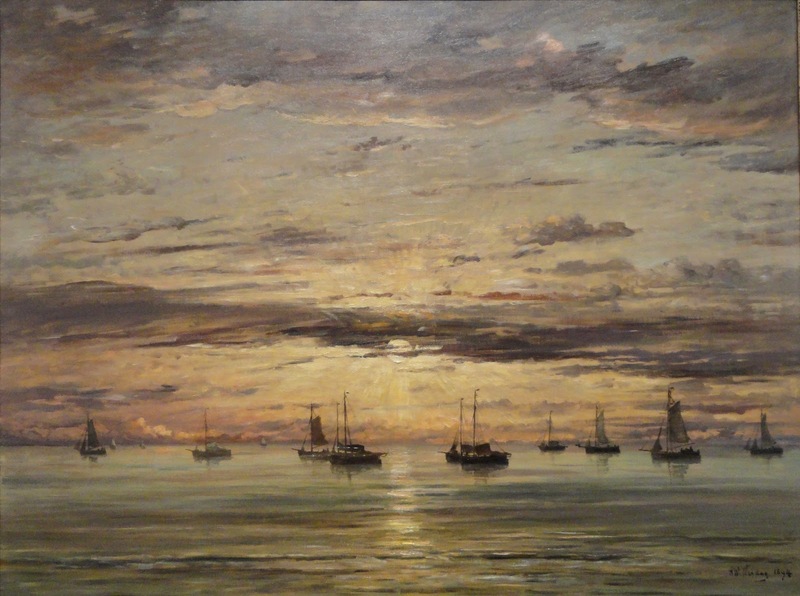 Among his best-known works may be mentioned “A Fleet of Fishing Boats at Scheveningen”; "Ready to Weigh Anchor, Scheveningen”; “The Scheldt-Morning”; “Sunrise on Dutch Coast”; “Collision”; “Looking for Anchors After Storm-North Sea” and “In Danger”. 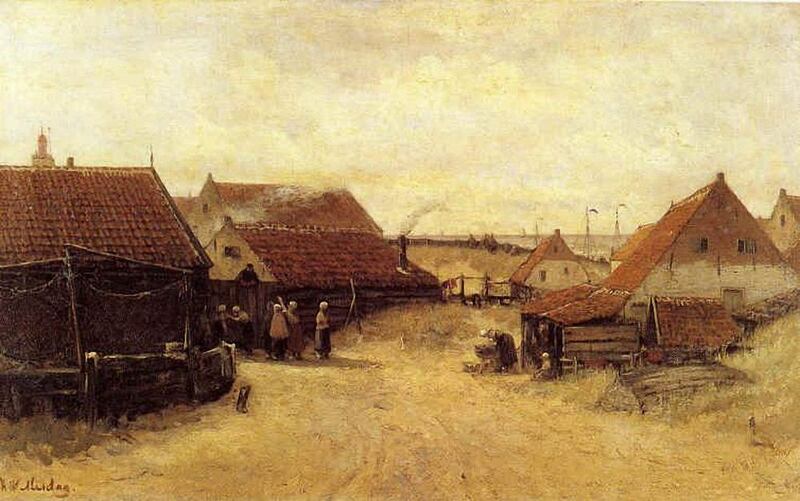 The artist lived at The Hague, where he had a beautiful studio. 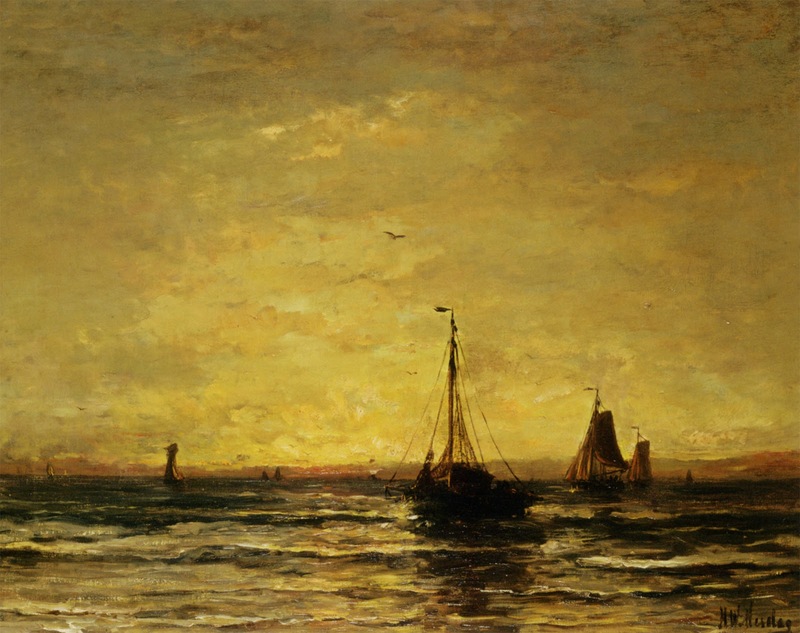 His wife is a painter of considerable distinction. 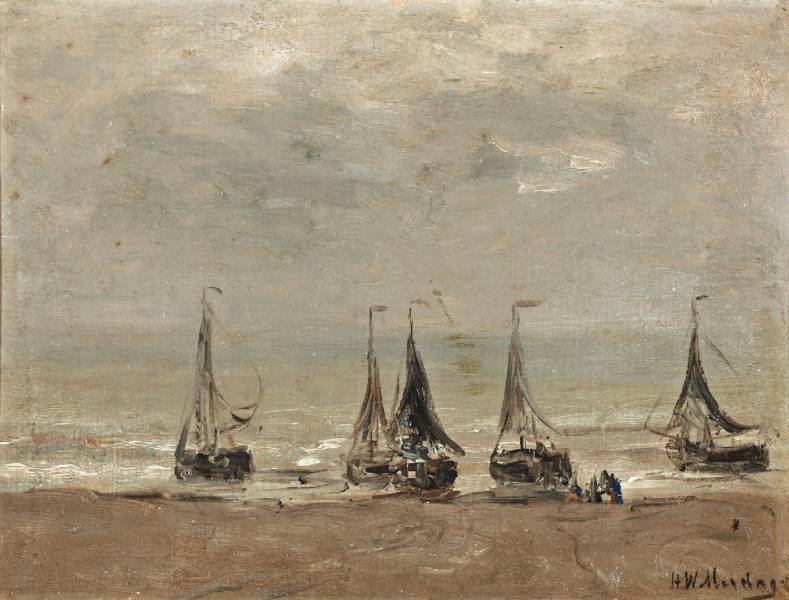 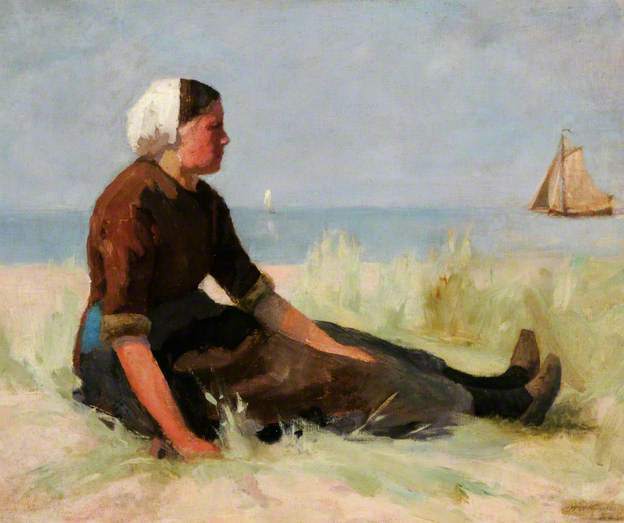 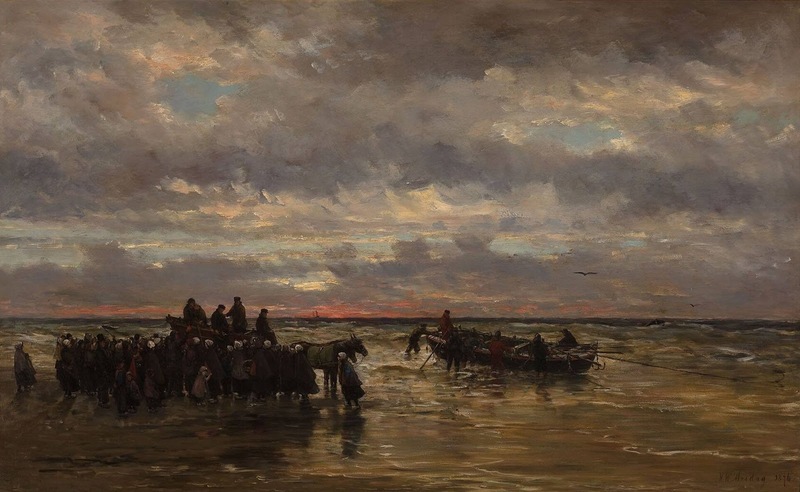 Hendrik Willem Mesdag (Groninga, 23 febbraio 1831 – L'Aia, 10 luglio 1915) è stato un pittore Olandese. 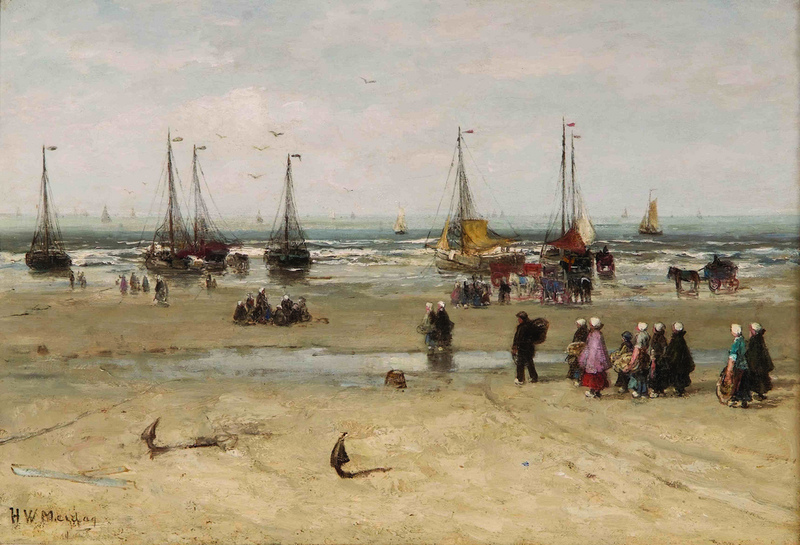 Nato a Groninga, figlio del banchiere Klaas Mesdag e di sua moglie Johanna Wihelmina van Giffen, Hendrik Willem fu incoraggiato da suo padre, pittore amatoriale, allo studio dell'arte. 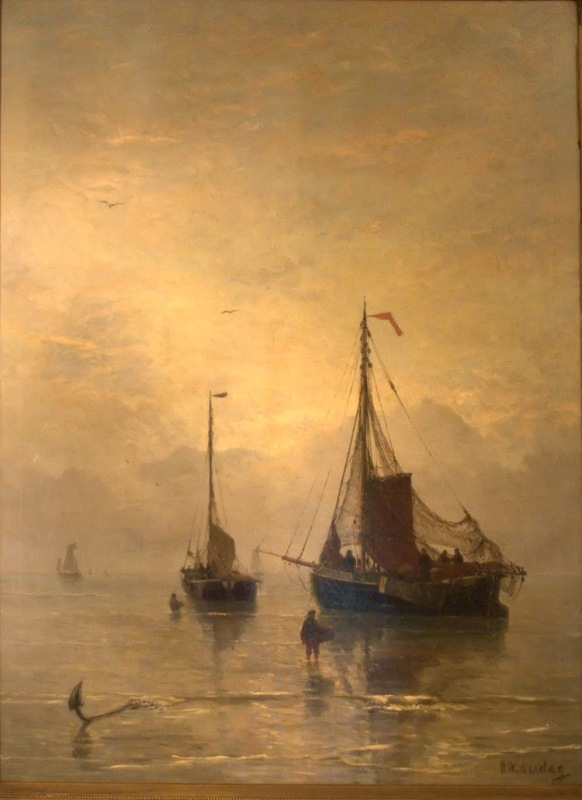 Sposò Sina van Houten nel 1856 e la morte del padre di lei gli consentì di ereditare una cospicua fortuna che gli permise di ritirarsi dalla carriera finanziaria e di dedicarsi totalmente alla pittura. 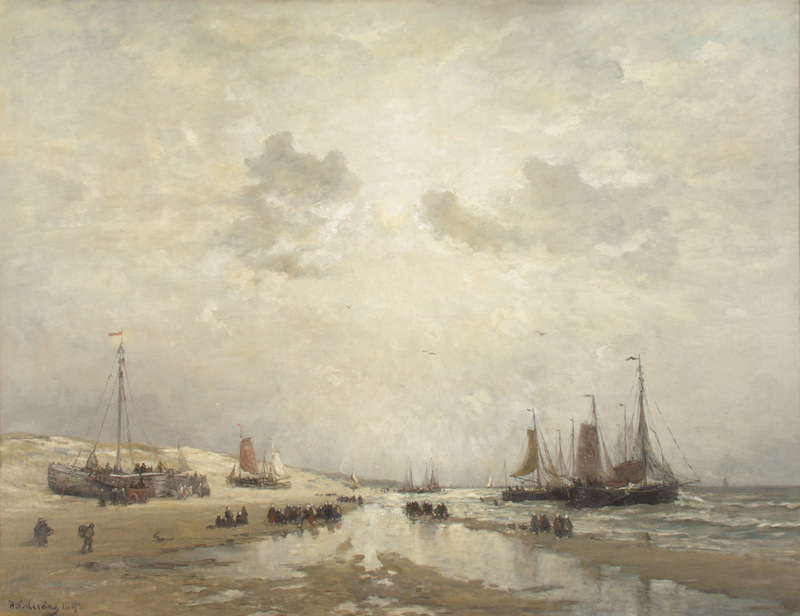 Studiò a Bruxelles con Willem Roelof e, nel 1868, si spostò a L'Aia, in Olanda, per dipingere il mare. 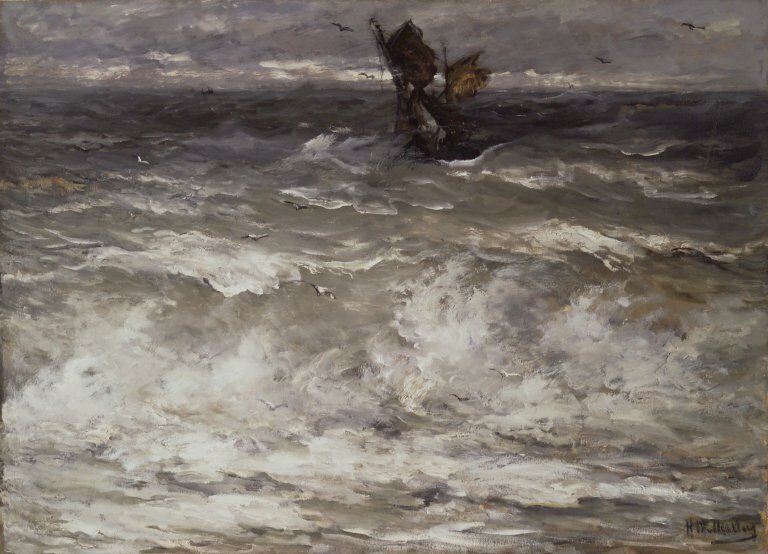 Nel 1870 espose al Salon di Parigi e vinse la medaglia d'oro per "I domatori del mare del Nord". 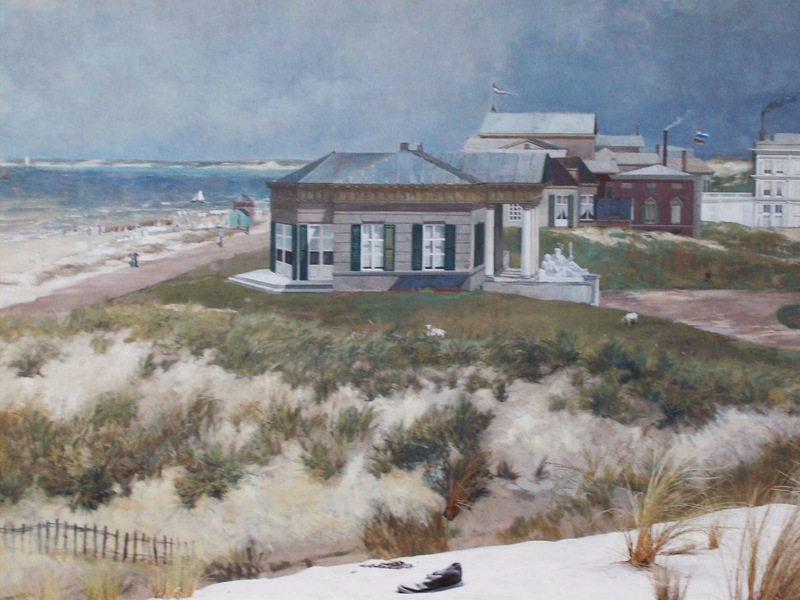 Nel 1880 ricevette una commessa da parte di una azienda belga per dipingere un panorama che offrisse una vista sul villaggio di Scheveningen sulla costa del mare del nord vicino a L'Aia. 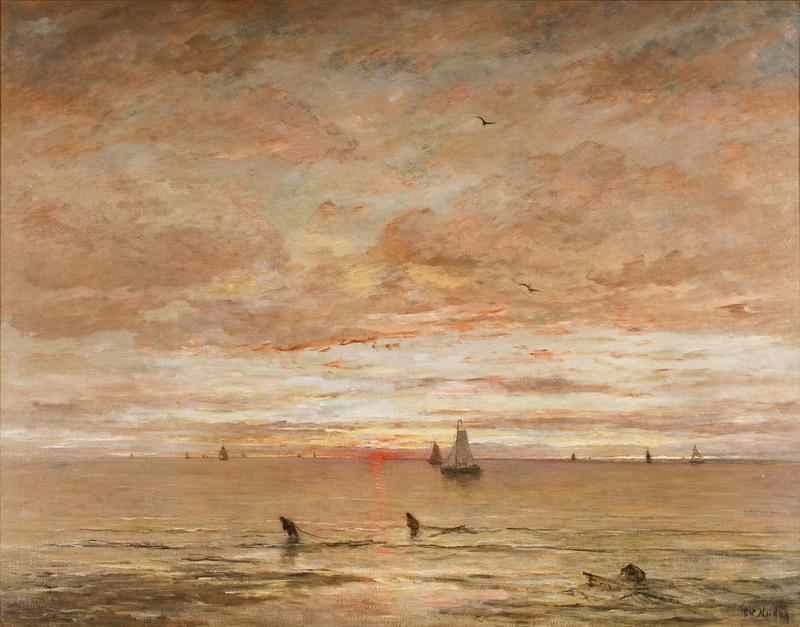 Con l'aiuto di Sina e di altri studenti nel 1881 completò l'enorme dipinto denominato Panorama Mesdag - 14 metri di altezza e 120 metri di circonferenza - che rappresenta la sua opera più famosa. 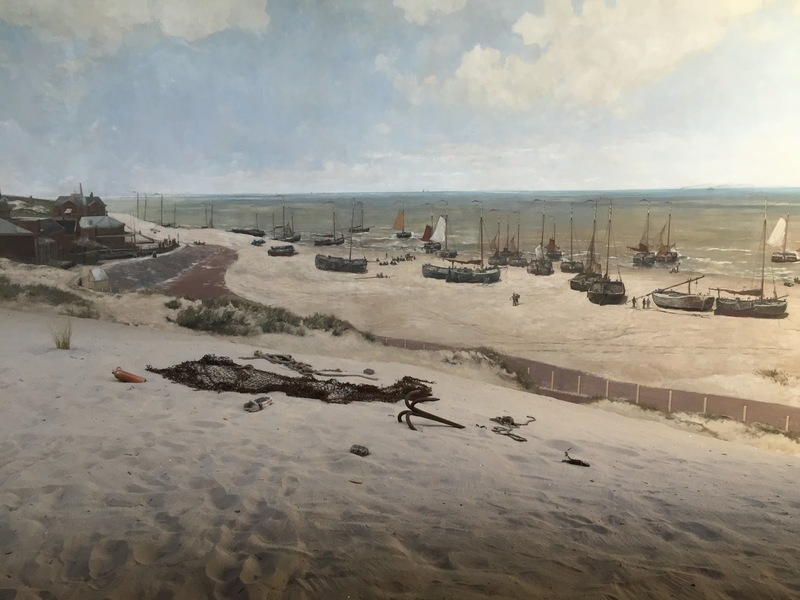 Tuttavia la moda per i dipinti di panorami stava esaurendosi e, quando la società proprietaria del Panorama Mesdag fallì, Mesdag acquistò il dipinto ad un'asta coprendo successivamente di tasca propria le perdite accumulate dalla società. 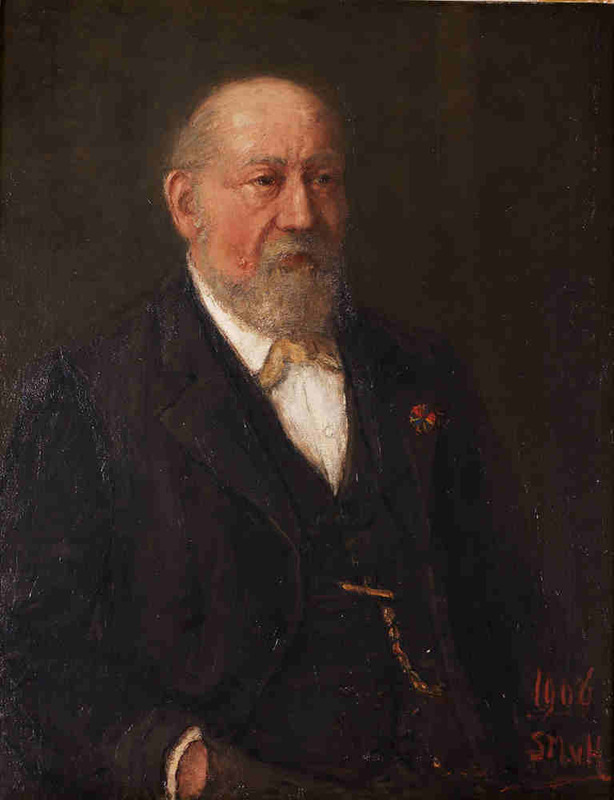 Divenne membro della Società delle Arti de L'Aia (lo Studio Pulchri) e nel 1889 ne fu eletto Presidente. 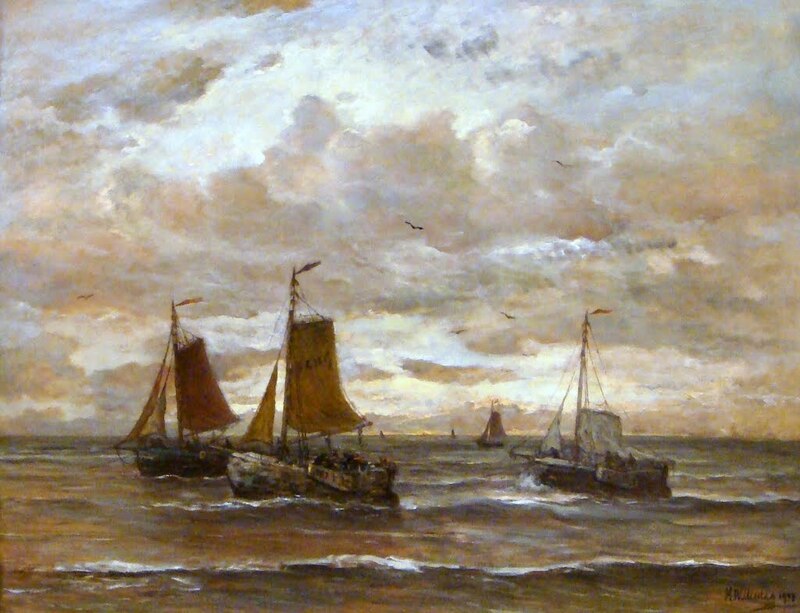 Nel 1903 donò la sua casa a Laan van Meerdervoort e i suoi quadri all'Olanda. 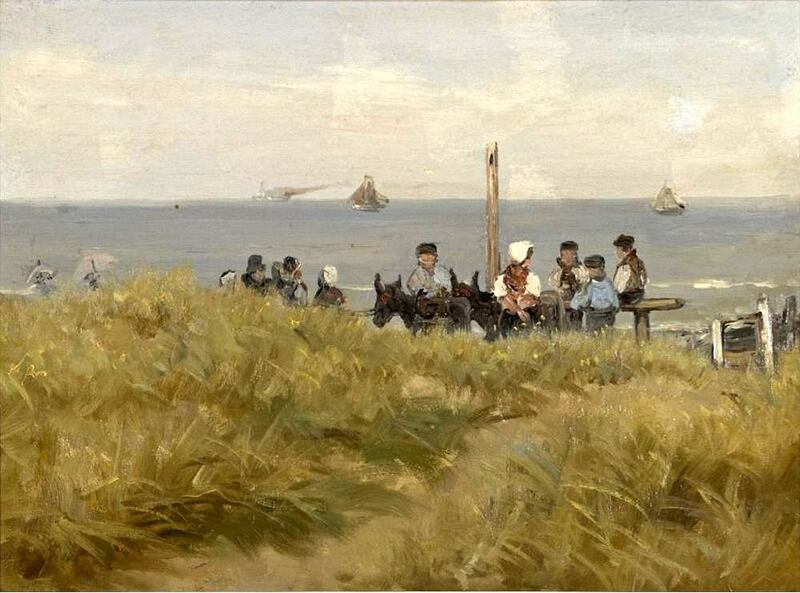 La sua casa è oggi il Museo Mesdag che ospita oggi pitture e acquerelli di Mesdag e della moglie.